Evelyn O’Connor is conducting alchemy with common substances in Beaconsfield’s Upper Space, where her enigmatic processes are open to observation. Evelyn has been invited work in Beaconsfield’s Upper Gallery space to develop her practice of effecting metamorphosis on common substances. O’Connor’s emphasis on process is well suited to Beaconsfield’s practice of inviting artists to research and develop their work in public. Over the coming weeks, the artist will focus on creating a new series of works influenced by her immediate environment and from a variety of readily sourced materials. 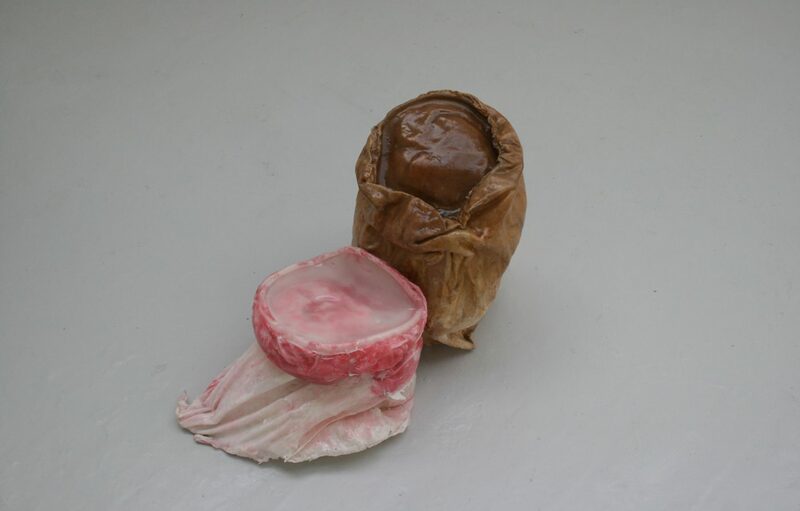 ‘My sculptural practice is led by a fascination with the obsession to dress one thing up as another and transform the objects and materials of everyday life. I choose homely objects and materials as a means to investigate colour, shape, line and the relationship between us and the objects and materials we surround ourselves with. The dynamic between the literal and imaginative status of the objects is also achieved through the use of materials and colour in my work. The colour of some of the objects is used to de-familiarise them, making them seem appropriate parts of the imagined scene. Alchemy is at the forefront of my ideas and subject matter for this residency. The unorthodox use of materials is an important part of my work and transformation a key concern in my practice. I like transforming everyday materials to replicate traditional sculptural materials, for example, sugar mixed with glue resembles wax when dry. Beaconsfield’s Upper space holds a lot of interesting features, like the slanted floor, which I will be looking to utilize. The space will also be the biggest workspace and exhibiting space I have had, which creates at lot of opportunities in terms of scaling up my work’. Image: Evelyn O’Connor, Lumbering. Cloddish, 2015. Dimensions variable, brown sauce, sugar, pva glue, strawberry syrup, polyester filling.